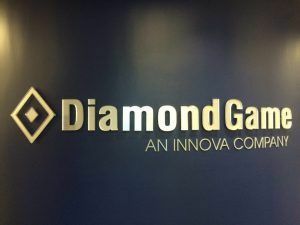 Diamond Game is a company that designs, produces, and services games, gaming systems, and tickets for many different Lotteries in North America and alternative gaming markets. They’ve been around for over 20 years, and a company is bound to make some branding changes if they’ve been in business for that long. 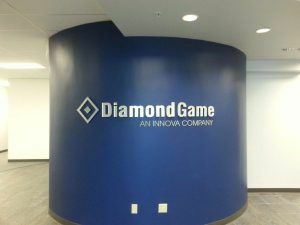 Diamond Game had an existing interior sign, however, they were updating their logo so they asked us to create a similar sign but with their new logo. Diamond Game’s headquarters is right in our neighborhood of Chatsworth, California. They wanted to update their logo sign to make sure it reflected the new logo they were using for their marketing so visitors of the location wouldn’t be seeing two different logos. It’s important to make sure that your logo matches in all of our marketing because it can look unprofessional if you have one logo on the website and another for your lobby sign. Logo colors can also make an impact on how your business is reflected. The pillar is painted blue like their logo, so they were able to make the entire sign metallic without compromising their branding. This method works great if you have a colorful logo, but you want the sign to be made from metal. 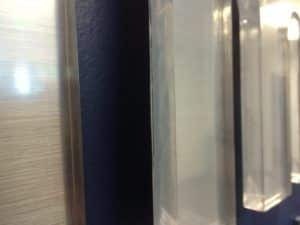 You can always paint metal, but then it will lose the metallic sheen that most people are looking for when they get a metal sign. Whether you are a retail store or a headquarters, a logo sign is a great addition to your interior, especially if you are in a large office building and you don’t have storefront space for a logo sign. Many times, businesses will have both an outdoor logo sign and an interior logo sign which can be great if you have the space for it.